Recipe: Double-bacon, maple-whiskey, oven-baked beans. Ridiculously long title, I know – but somehow there is no other way to ensure you are going to try these beans without telling you upfront that there is something really special about them: ie: double-bacon. This recipe is the result of a happy accident in following this recipe as well as the addition of whiskey, as well as an amended cooking time to ensure that the beans were actually the right consistency (the recipe I just linked to will only result in soupy, thin beans I’m afraid, I don’t know what they were thinking on the cooking time). And yes, I used a stock photo of baked beans (probably those canned Heinz beans) even though mine are far superior – because there was just no way for me to attractively photograph the beans I made last night. 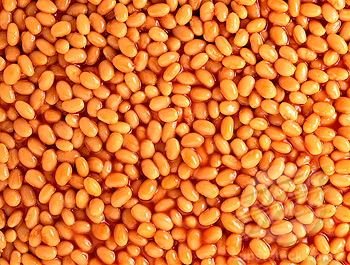 Rinse your beans after soaking. Cover with water and bring to a boil. Simmer over low heat, stirring occasionally, until just tender, about 2 hours; or just cook them however your normally do until they are done, but still a little firm. Drain the beans, reserving 4 cups of the cooking liquid. Rinse the beans in a colander. Transfer the beans to a large, deep baking dish. (If you want to do this step the night before, which I did – you can reheat the beans by plunging them into a pot of boiling water for 5 minutes). Preheat the oven to 375°. In you cast-iron fry pan, cook the 1/4 inch bacon strips over medium heat until they are cooked but not crisp – about five minutes. Add the onion and cook until the onion is soft (if you want to go for caramelized, turn the heat down and go much longer). Stir in the apple cider vinegar, shots of whiskey, brown sugar, molasses, crushed red pepper, black pepper and 1 1/2 tablespoons of kosher salt and heat through until the sugar is dissolved. Pour your frying pan full of goodness over the beans along with the reserved bean cooking liquid. Cover the beans with foil and bake for 3 and a half hours, checking every 45 minutes or so on the consistency. Most of the liquid should be gone by the time they are baked like a bean should be. While you are baking the beans, mix the maple syrup, wine vinegar and mustard powder. Arrange the remaining 8 bacon slices on a rimmed baking sheet, and generously brush them with the maple syrup mixture. Bake the bacon in the same oven as the beans for about 25 minutes, basting 3 or 4 times and turning the bacon three times, until richly glazed. Transfer the bacon to a plate. Pour 1/3 cup of water onto the baking sheet and return it to the oven for about 3 minutes to dissolve the caramelized syrup. Uncover the beans and stir in the syrup. Cut the glazed bacon into pieces and stir them into the beans. Put the whole thing back in the oven to stay warm until ready to eat. Or eat them right away after letting them sit for fifteen minutes out of the oven. They are awesome. Megan! Step 3 is confusing me. Add pan full of stuff to bean liquid then everything goes into the beans? That’s cause there is a type. It should say pour your panful of goodness over the beans. Not “of” the beans. I will fix. Thanks for spotting. Typo. Typo. Damn. I need a holiday.